AC applications of superconducting materials. AC losses in superconducting materials. Amorphous superconductors. Anisotropy in magnetic materials. Anisotropy in superconducting materials. Biomagnetic measurements. Chevrel phases. Coercivity and domain wall pinning. Coherence length, proximity effect and fluctuations. Design with magnetic materials. Design with magnetic materials: computer simulation. Domains and domain walls. Ferrites, hard. Fluids, magnetic. Flux creep phenomena. Flux pinning and the summation of pinning forces. Granular superconductors. High-frequency impedance of superconducting materials. High-frequency properties of magnetic materials. Josephson effects in weak links. Magnetic energy storage. Magnetic properties of superconductors. Magnetic separation. Magnetic storage media. Magnetic units and material specification. Magnetization imaging. Magnetocaloric effect. Magnetoelastic phenomena. Magnetooptic materials. Magnetooptic storage media. Millimeter-wave detection. Multifilamentary superconducting composites. Nanocrystalline soft magnetic materials. Niobium-titanium alloys. Nonequilibrium superconductivity. Nuclear magnetic resonance imaging. Optical properties of superconductors. Organic and molecular ferromagnets. Oxide glasses as magnetic materials. Oxide superconductors: ceramic processing. Oxide superconductors: physical properties. Oxide superconductors: thin-film deposition. Power loss in magnetic materials. Radiation effects on magnetic materials. Radiation effects on superconducting materials. Superconducting magnets. Superconducting materials: BCS and phenomenological theories. Thin films and multilayers, magnetic. Magnetic and superconducting materials pervade every avenue of the technological world – from microelectronics and mass-data storage to medicine and heavy engineering. Both areas have experienced a recent revitalisation of interest due to the discovery of new materials, and the re-evaluation of a wide range of basic mechanisms and phenomena. This Concise Encyclopedia draws its material from the award-winning Encyclopedia of Materials and Engineering, and includes updates and revisions not available in the original set -- making it the ideal reference companion for materials scientists and engineers with an interest in magnetic and superconducting materials. Contains in excess of 130 articles, taken from the award-winning Encyclopedia of Materials: Science and Technology, including ScienceDirect updates not available in the original set. 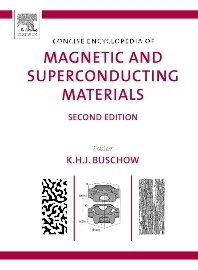 Each article discusses one aspect of magnetic and superconducting materials and includes photographs, line drawings and tables to aid the understanding of the topic at hand. Cross-referencing guides readers to articles covering subjects of related interest. Material scientists, engineers. Any scientist or technologist with an interest in magnetic and superconducting materials.